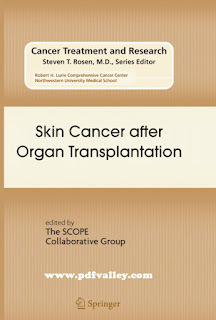 You can download Skin Cancer after Organ Transplantation by Steven T. Rosen free in pdf format. Organ transplantation has been performed for almost 40 years with steadily increasing success regarding long-time survival of the graft, as well as quality of life for the patient. However, graft tolerance only can be achieved via induction and maintenance of an impaired immunological surveillance. 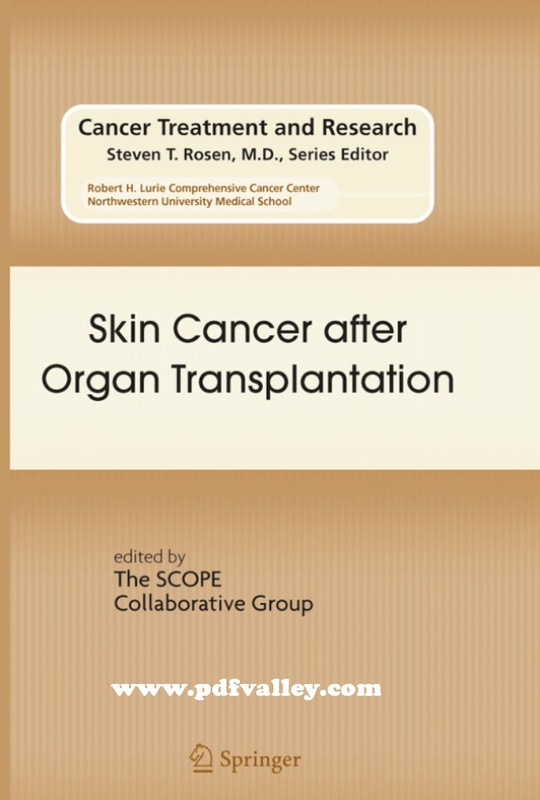 An increase of skin cancers as a consequence of the lowered cellular immunoresponse seems to parallel the overall increased long-time survival rate of organ transplant recipients. Against the background of chronic immunosuppression known risk factors like the amount of sun exposure prior and post transplantation, oncogenic viruses as well as the genetic background, and place of residence (latitude) are strongly related with the increased skin cancer incidence. The increasing incidence of non-melanoma skin cancer, paralleling a prolonged survival of patients after organ transplantation, represents a significant reason for morbidity and long-term morbidity in organ transplant recipients worldwide. The incidence of non-melanoma skin cancer in liver-, kidney- and heart transplant recipients varies from 1.5 to 22 %, 2 to 24 % and 6 to 34 % after &lt; 5 years post transplant. Ultraviolet radiation as well as immunosuppressive therapy are crucial risk-factors regarding the induction and progression of skin cancer. Ultraviolet radiation is related to the induction of DNA damage, as well as interference with Langerhans cell antigen presentation and a Th1 - Th2 shift induced via a release of IL-10. Whereas the overall duration of immunosuppression and the cumulative dosage applied are relevant parameters in the evaluation of an increased tumor risk, individual differences between specific immunosuppressive agents remain unclear. The workup of genetic as well as other unclear phenomenon like the reverse BCC/SCC ratio might shed some further light into the genesis and immunology of the non-melanoma skin cancer in general.